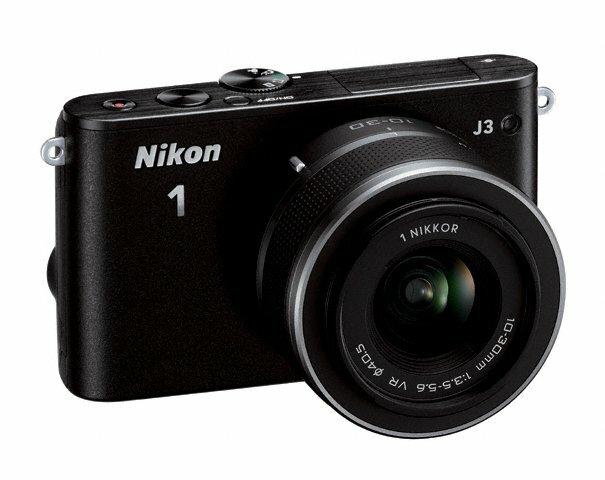 After weeks of speculation Nikon has announced the Nikon 1 J5. The new camera has a number of upgrades, the biggest of which is the 20 megapixel back-side illuminated sensor. Could it be a Sony? I’ve always thought that Nikon using the Aptina sensors was due to the sensor readout speed, needed for both the crazy fast phase detect autofocus of the 1 cameras, as well as the impressive continuous shooting rates on them. Has Nikon managed to marry both speed and quality this time? Other improvements include a flip LCD that goes both up for selfies and down for overhead shots, an additional command dial in the traditional Nikon thumb position (which I very much welcome) and a mode dial that has dedicated manual exposure modes. Oh, there is now a custom function button next to the lens mount too. At the very least ISO should be pegged to it. The camera retains the speed of the J4 before it, with the 170 PDAF points and 20 FPS continuous shooting speed with continuous AF, and 60 FPS with AF lock on the first frame, which is still impressive in 2015. Now, the other upgrade is a bit embarrassing: Nikon has given the J5 4K video capability, but at 15 FPS. Um, I am not sure who is actually going to use it at 15 FPS. Coincidentally 4K at 15 FPS has the same data rate as 1080p at 60 FPS, so it does sound like the engineers were pressured into delivering a 4K solution with whatever they had on hand for a marketing headline. As much as I like the Nikon 1 cameras for what they are, such moves really do not help the line. Already I see the less than kind comments about it, and the last thing the Nikon 1 cameras need are more jokes to be made about them. It seems a shame too, as the cameras are slowly improving, and I really did quite like the Nikon 1 J4 despite the somewhat noisy sensor. Nikon really should have tried to address the criticisms head on, which they appear to have with the upgrades on hand, as the J5 has the better user interface, possibly better sensor, and better pricing, with the 10-30 PD kit coming in at a reasonable US$499 (US$100 less than the J4). 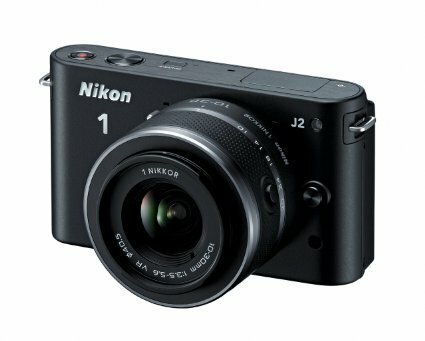 Nikon has announced the successor to the V2, and I am not sure what they are trying to do now. In fact, the normally neutral DPReview have a not-very kind commentary piece on the camera at launch. Well, here we go again. 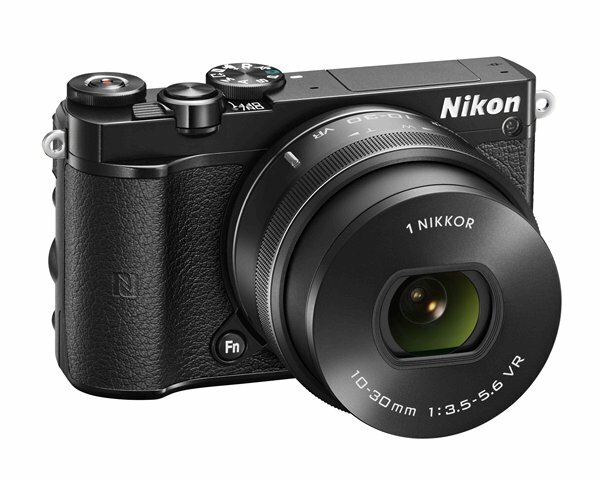 If you follow this link (not an affiliate link), you can find that the Nikon 1 J2 with the 10-30mm lens going off as low as US$287.99 with the memory card and bag (discounts all applied at checkout). 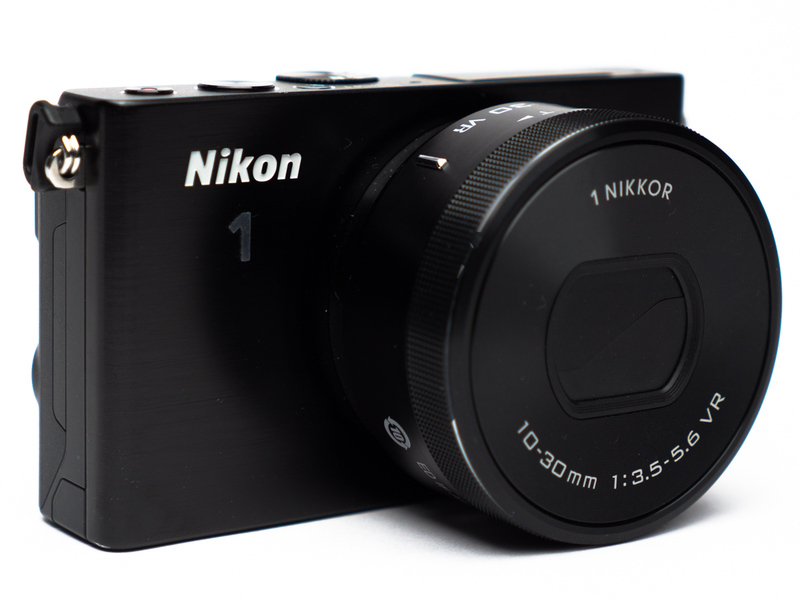 Once again, Nikon should just start selling these cameras at a lower price to begin with. These massive clearouts are only teaching the rest of us that the Nikon 1s are best bought older at a massive discount. Who’s going to buy them new at the rather high price? It’s PMA season! Well, kinda. Now that the PMA show has merged with CES, it means that what is left of PMA is usually dedicated to consumer cameras. 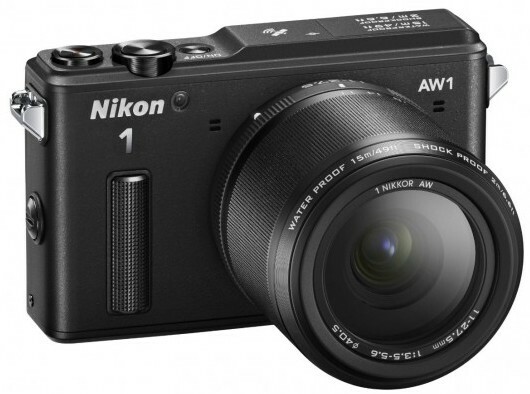 So here is something fairly consumer-ish: New Nikon 1 cameras. Hey you! Don’t yawn! Be glad we’re not covering all the uninteresting compacts! Here’s a quick update of what else arrived in Singapore in the last week. 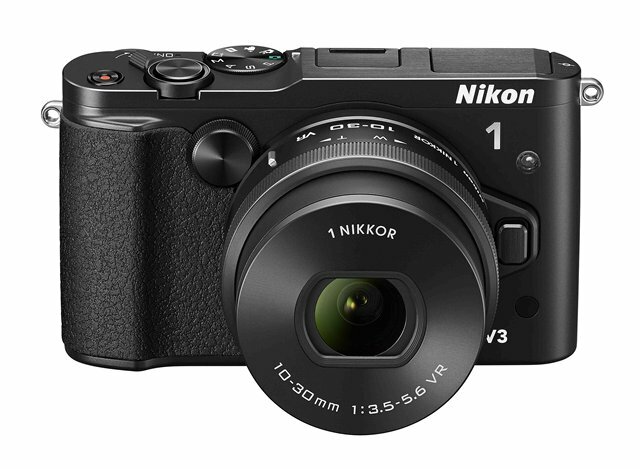 Firstly the Nikon 1 V2 is now available, and the basic kit price is at over S$1,000. I have yet to try the camera personally, unlike CK who managed to spend some quality time with it in Japan, but I don’t think that whatever the improvements are, it is going to be worth that kind of price premium. A camera like the D3200 is almost 20% cheaper, despite costing more to produce. Nikon really needs to re-evaluate their pricing on the 1 line if they are going to be competitive with the other mirrorless system cameras. Along with the V2 also comes the Nikon 1 18.5mm f/1.8 lens. So if you want a fast prime for your 1 system, this is a good start (and currently the only start, if you ask me). 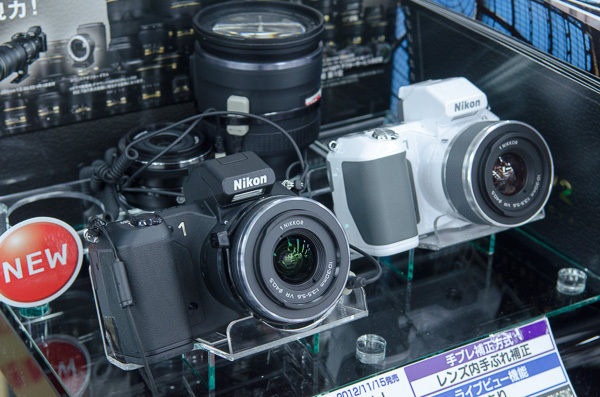 Black and white models of the Nikon 1 V2 on a shelf at Yodobashi Camera, Tokyo. 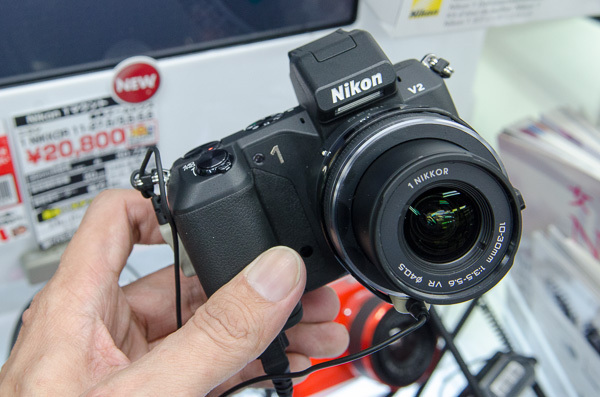 I chanced upon the newly released Nikon 1 V2 at Tokyo’s Yodabashi Camera store while I was on holiday and decided to give it a quick hands-on test. One of the biggest differences between these great stores is that customers are able to play with a lot of gear without having some pesky salesman stare at you, which is a great plus. Unfortunately, the battery/SD card door was taped shut and thus I was unable to insert my own SD card to get some sample shots. Ah, now I know why there’s a sudden price drop of the Nikon 1 V1 cameras. 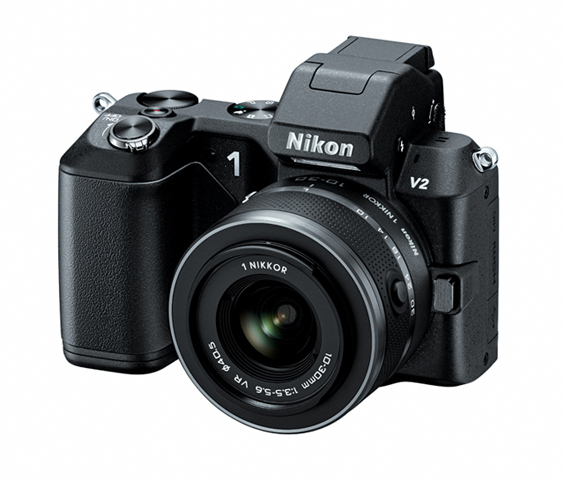 It’s because Nikon now has the Nikon 1 V2, announced today. The camera is an upgrade to the V1, sporting a 14 megapixel CX-sized sensor, built-in flash, a mode dial (finally), a customisable function button (finally) and a built-in hand grip. YS: Ye gods, is that hump on top ugly or what? In fact, I can see the flash panel exposed in the image – This reminds me of Transformers toys with inelegant kibble bits stuck behind the robot, except this time it is hanging off on the front. YS: To clarify on another point, there has always been a mode dial for the 1 cameras, just that this time the traditional PASM modes are there as well. However, there is still no button dedicated to the ISO setting, which means the customisable function button is not going to be so customisable after all, since most photographers will set it to ISO. Still, having a proper command dial is a good thing. Oh, and get ready for a new battery – the V2 uses the new EN-EL21. CK: Nikon has also added a a Live View Control – giving a preview of exposure effects on the LCD and EVF prior to shooting.There’s also a “Slow View” mode which buffers 40 frames over 1.33s when you half-press the shutter button, then replays them at 1/5th speed, letting you choose your own decisive moment. A little gimmicky, in my opinion. The camera will retail at the V1’s original list price of US$899 with the 10-30mm kit zoom in late November. YS: This camera really needs to be S$899, not US$899. Plus, I am sure many early adopters are going to remember the V1’s incredible price drop (more than 50% over one year), and will tell their friends about it. Customers will remember when they’ve been burnt. Not Nikon’s best moment, really.